Lansing Eastern’s LaDontae Henton was a high-major recruit the second he stepped on the floor at Don Johnson Fieldhouse as a freshman. He was big, strong and athletic for a freshman, but he was also older than the average 9th grader — a finer point not often made about older players in younger grades. Even though so many already had him penciled in as a five-star recruit, I always took the “not so fast” stance with Henton, because I’d never seen elite level athleticism out of him. To me, he always looked like a really good high school power forward at 6-foot-5. The Quakers of Lansing Eastern couldn’t transform a dominant performance by LaDontae Henton into a win over Sexton, but they did get to show off one of the top freshmen in the state. 5-11 guard Charles Tucker, Jr. scored eight points in his highly-anticipated debut for the Quakers. The Detroit Free Press picked Eastern as the 11th best team in the state in the preseason. Our resident ranker, Gavin Raath, was less sure of the Quakers and picked them to finish 5th in the CAAC Blue. I may have seemed obsessed with point guards in my last post, but the Lansing area’s best is full of bigs instead. 1. 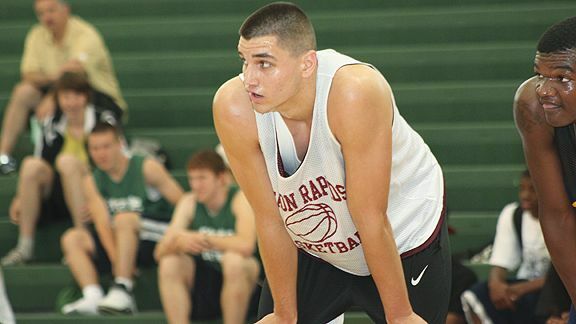 Alex Gauna 6’9″ Senior Eaton Rapids — The MSU commit has evolved his game consistently since he was a freshman. Easily the best Lansing has to offer. 2. Cole Darling 6’7″ Senior Holt — Wright State commit is a total stud. 3. 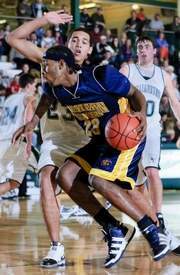 Jon Horford 6’9″ Senior Grand Ledge — It will be interesting to see where this high major prospect lands. Ultra talented. 4. LaDontae Henton 6’6″ Junior Lansing Eastern — His production is more inside than outside, though many hoped he’d be a legit wing by now.